Tell the truth, what do you think of when you think about California? A lot of that California image is about longhaired blonds, surfing and a laid-back life style. So, I think Jamey Whetstone is the quintessential picture of the cool, laid back Californian. This is Jamey and me at the bar at the Belfry. What do you think? The crowd at a recent Wednesday tasting had the chance to meet this exceptional winemaker in person. It is always fun to hear how each wine you are tasting took its course from a grape on the vine to the juice in your glass and to hear it from the man who actually made all the critical decisions is even more exciting. I am happy my search for wines to serve guest at our bed and breakfast let me cross his path. This is the second time I have met Jamey Whetstone the founder and winemaker at Whetstone Wine Cellars, a boutique Napa Valley winery. Based on his appearance and his general California attitude, one would think he is a native of the wine country fulfilling his destiny, but oh how looks can be deceiving. At our tasting, Jamey shared four of his excellent wines and his unusual career path to creating great wines. As the night of sharing proceeded, we learned that Jamey actually hailed form the East coast and moved form Charleston, South Carolina to St. Helena to manage the famous Mustards Restaurant. Jan and I have had the pleasure of dining their a few times on our Napa excursions and loved it. Jamey told wonderful side stories about the great Robert Mondavi sitting at his bar challenging him to find a better Pinot Noir than he personally had made for Mustard's to serve as their house wine. 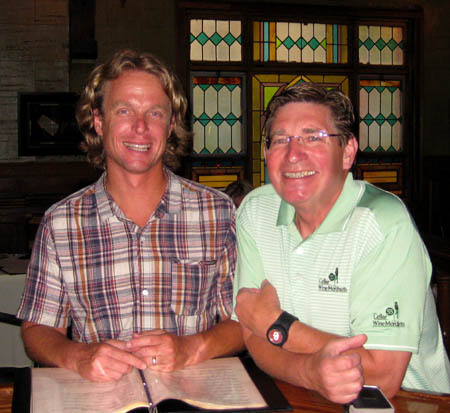 Jamey described his official entry into the wine industry as a temporary hiatus from the restaurant business that had him driving a tractor in the vineyards of Larry Turley. He credits this accidental detour with the discovery of his passion for making wine. Jamey gained invaluable experience with some of the most notable wine masters of Napa Valley and know has his own labels, a growing reputation and a near cult following. 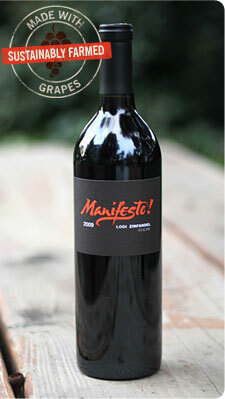 We tasted three wines from a joint venture called Manifesto Wines. With humor and refreshing honesty, Jamey explained how Manifesto was created to produce affordable and highly marketable wines. He shared that they also help him support his passion as expressed in the limited production Whetstone Cellars’ Pinot Noirs. We started with a nice 2009 Manifesto North Coast Sauvignon Blanc pared with Barnstable Oysters. Next we had an easy drinking, 2009 Manifesto Lodi Zinfandel pared with Grilled Fresh Black Mission Figs with Honey Goat Cheese. Then the 2009 Manifesto North Coast Cabernet Sauvignon matched with a Grilled Pineland Farms Flat Stake. We finished with the 2010 Whetstone Cellars Jon Boat Sonoma Coast Pinot Noir accented by a very nice Belgian Chocolate Flan. 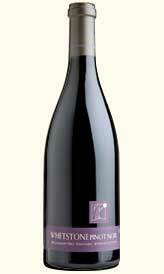 The last was the best, but then I seldom have met a Pinot I did not like. The final wine also spoke to Jamey’s passion. Throughout the evening he spoke of his good luck and the fortunate experiences that guided him, but I think his talent and skill have more to do with it than random luck. I enjoyed his wines as much as his stories and have found some new wines for guests at our Inn. Join us and I’ll do the best I can to repeat Jamey’s stories as we share his Manifesto and maybe his passion too.